Eye images provide additional data and allow you to immediately spot factors that could disturb the calibration and data recording process, like ambient lighting or optimizing the eye tracker’s position, which ensures optimal data collection conditions from the very beginning of your study. Read more about it here. The eye images video can be accessed live and during recordings, and it can be saved on the SD card for further analysis. This feature is important for environments with lighting ranging from light to dark, which results in under- or overexposed areas in the resulting imagery. With the gaze spot meter, the scene camera’s exposure will be based on the area where the subject is looking, resulting in better video quality. 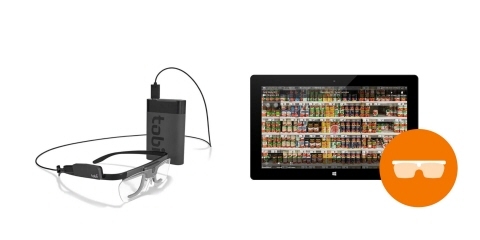 Here you can learn when to use the Gaze Spot Meter in a Tobii Pro Glasses 2 recording. On Tobii Pro Glasses 2 eye trackers with the 100 Hz frame rate, it is now possible to switch between 50 and 100 Hz based on your study needs. To download Pro Glasses Controller software or to learn more about it and Pro Glasses 2, click here.